This is a specialized jeweler's workbench with an emphasis on wax-carving and stone-setting. The bulk of the design was created by Ben Steiger (the client). This is one of those projects where my earlier life as a jeweler really came in handy in refining the design. 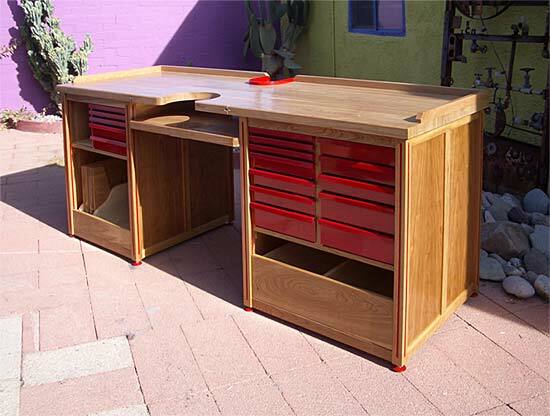 The key features of this bench include: Work-surface inserts, support for a binocular microscope, lots of storage, cost-cutting drawers, spiffy red details and racing-stripes. Many of the dimensions were determined by specific storage requirements for Ben's tools. Cherry, cherry veneered board, steel drawers, etc. Polyurethane finish on work surfaces. Shellac finish on the cabinets.